Coming less than two years after his successful collection Nismagħhom Jgħidu, Joe Friggieri is now offering a new volume of short stories, honed with precision. Their prose often reminding us of the poet he is especially in their descriptive elements. There are very short pieces like Il-Pittur and Fuq iz-Zuntier in which he conjures a whole story out of an image like that of a young Eritrean boy experiencing a village festa, or a painting vividly expressing an artist’s remembrance of a scary boyhood memory. Some of the longer stories are proper narratives, most of them about women looking at marriage when in that relationship, or thinking of it warily if they are not married. In fact, Friggieri is reacting to how women, their rights and their problems are occupying so much attention in our time. Thus, in the title-story a girl marries a young man with whom she does not seem madly in love, persuading him to spend the first days of their honeymoon on a small Maltese island resembling Kemmuna which fascinates her. Her uncle, a former teacher who now farms on the island, is not surprised by his niece’s choice of a honeymoon place and her new spouse. While not overenthusiastic, she goes along with her wishes. In Il-Lampa ta’ Aladin, Friggieri shows us how a man goes into the priesthood because his sexual life has not worked out as he has wished it. When he had truly fallen in love, the woman had ultimately refused him after questioning him on the two women he has been related to before her, thinking her predecessors had remained too much in his mind. 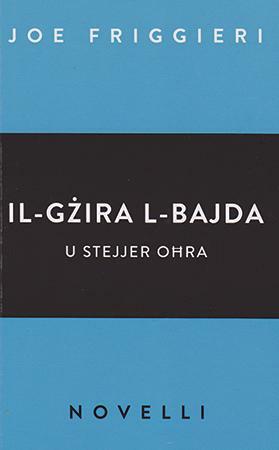 The trouble caused by the thought of others, past or present, can be very great and is told most interestingly in Il-Bronja where a married woman listens again and again to a sea-shell where she thinks she can hear the voice of her first and greatest love whom she lost many years back echoing. In No(ra)vella a wife punishes her errant husband by sending him a series of mischievous e-mails. In L-Isem l-Ieħor a husband, suffering from senility, reveals in his confused remembrances a relationship he once had with another woman, a story with a touching ending. In Dussman two young women accidentally meet and fall immediately in love, a meeting on which the male suitor of one of them eavesdrops, the author leaving it to the reader to visualise what the eavesdropper feels and thinks. The last sentence hints at what happens when a hetero spouse sadly discovers the truth about his or her spouse’s different sexuality only after marriage. Another story with a lesbian character in Vaganza t-Tuneżija has her discover to her chagrin that the young man she has used and then treated most uncivilly has paid her back cruelly. Other stories depict a variety of characters like the school teacher who is hit again on the back of his head while at the cinema by a pupil who hates him and does not have the guts to react forcefully, or the tourist guide well-known for giving those he is guiding a mixture of facts acknowledged by historians and tales regarded as purely legendary. It is likely that the guide’s views regarding legendary tales as being part of a people’s cultural heritage may be also the author’s views, for in the story they are voiced very forcefully by the guide. Il-Post u ż-Żmien, about a Jewish woman whose family suffered much in the Holocaust, Friggieri’s style is as restrained as it usually is. On a first visit to Germany, the woman is shocked to discover that the handsome man she is talking to is a convinced ex-Nazi, and her reaction is to leave the country immediately. Her reaction is as powerful as it is unshowy.